Kris Osborn for Defense Systems: The Army has developed technology which enables drone air commanders to operate and view the real-time video feeds of multiple drones for helicopter crews simultaneously, improving existing service Manned-Unmanned Teaming (MUM-T), service officials said. The emerging technology expands upon currently operational MUM-T that allows Apache and Kiowa helicopter crews to view real-time feeds from nearby drones while also controlling the sensor payload. The new system, called Supervisory Controller for Optimal Role Allocation for Cueing of Human Operators (SCORCH), takes this technology a step further by giving in-flight helicopter crews an ability to view multiple drone feeds simultaneously. "SCORCH is a system consisting of intelligent UAS autonomous behaviors and an advanced user interface that allows a single operator to effectively control up to three UAS simultaneously," said Dr. Grant Taylor, Aviation Development Directorate Engineering Research Psychologist. 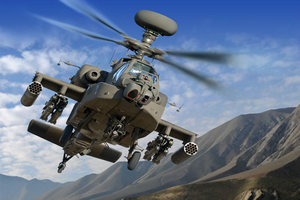 Service innovators, working with the Army Aviation and Missile Research, Development and Engineering Center (AMRDEC), said that new interfaces are part of a long-term Army project aimed at advancing sensor-to-shooter time for helicopter attack missions.